Set Up: 20x20y grid, with 5 yard finishing zone at end. Split group into 2 even groups. Purple Defender starts with the ball and dribbles across the field towards gate on opposite side, when the cross in front of blue attacker they stop the ball (leave it for blue attacker), then run through gate on opposite side. After they run through the gate they defender attacker. The blue attacker, when the ball is left in front of them attack two small goals, they must be in the 5 yard finishing zone to score. Once the attack is over then the players switch lines and roles. Keep score. 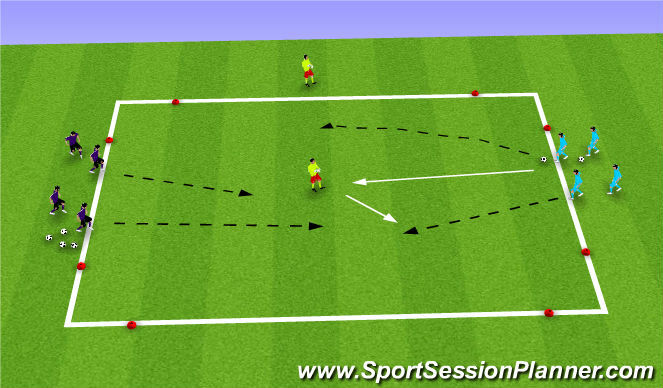 Add a second trailing defender from behind. Description: Players will be organized with a 2 v 2+1. If blue starts with the ball 1 neutral player will be in the middle and would play 3 v 2 and play is started when blue passes to their center player. The purple team would be defending and if win the ball can counter attack. As above 30x50 grid 2 small goals, goals must be scored on the ground. 2v2 in centre with 2 neutrals on the outside. 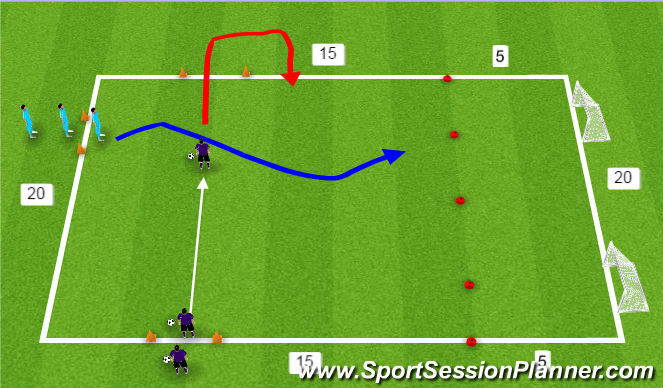 2v2 plus 2 neutral outdside players have 2 players off field on each side to counter when their team gets scored on. If the 2 players get scored on they go off the field and 2 new attckers come on with a ball to attack. 1. Ball must go through one of the neutrals before you can score. 2. can use big goals and GK. Set Up: 1/4 of a full size field if space is avaliable. Description: 3v4 1 big goal and 2 small counter goals. Ball starts with the GK, when the purple team wins the ball they look to counter (numbers up) to the big goal. Progression: add numbers of players if space is availiable.